LG G Flex made its way officially to the United States, so we managed to spend some one-on-one time with an AT&T version of the self-healing curved phablet. The LTE device is also offered by T-Mobile and Sprint across the Atlantic. The AT&T branded LG G Flex sports the same hardware as the Korean version which we extensively reviewed. Its specs include Qualcomm Snapdragon 800 SoC, 2GB of RAM, 32GB of built-in memory, 6” 720p curved P-OLED touchscreen, and 13MP camera. 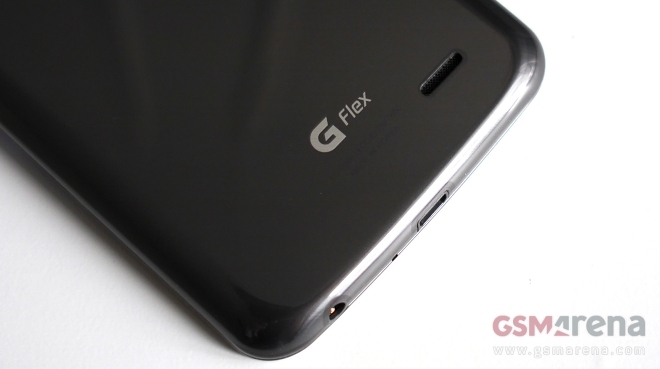 Unlike its Korean sibling which ships in a sleek-looking, well-appointed retail box, the retail package of the AT&T LG G Flex covers only the basics. Inside the orange/white box with AT&T branding you will find a charger, a USB cable, and a tool for removing the SIM card alongside a couple of booklets. In the flesh, the LG G Flex for AT&T looks as eye-grabbing as expected. AT&T deserves praise for keeping its on branding to a minimum. Save for a small globe on the back of the device, there are no other signs of AT&T presence on its body. Software-wise, the LG G Flex for AT&T boots Android 4.2.2 Jelly Bean, dressed in LG’s feature-rich, proprietary UI. There is good deal of AT&T bloatware on board but, thankfully, it can be removed by the user. With a $299.99 on-contract price LG G Flex for AT&T has plenty of competition to face in the mature US market. AT&T alone offers Samsung Galaxy Note 3, Nokia Lumia 1520 and the ageing but quite capable LG Optimus G Pro. Each of the phablet’s competitors offers more polished experience and, very importantly, better display for less money. However, with a combination of forward thinking tech and conversation-worthy appearance, the LG G Flex certainly deserves a look by users searching for a phablet which doesn’t conform to today’s standards in the segment. The device is as capable as it is characterful, so long as you are willing to accept its quirks and price tag.